Disruption in retail is the topic du jour, the eye of the storm so to speak (both retail tenants’ and retail landlords’ stocks have been battered), so it is appropriate that we get into a fulsome discussion of retail this year. In the be-careful-what-you-wish-for department, we made the prescient call four years ago that retail was in secular decline and acted on that by selling our malls,(17) spinning our strips into Urban Edge Properties, while retaining and even growing our flagship street retail in Manhattan. The struggles and failure (or near failure) of many household names in the anchor and chain store business. Traffic in shopping centers, while difficult to measure, is clearly declining and has been for years and so that makes a trend. Shopping preferences and how we shop have changed, especially among millennials. Most brands have become ubiquitous and, therefore, less differentiated and important. Price and on sale is the only strategy which seems to work. And then, of course, there is Amazon and the Internet. I do not believe we can grow our way out of this mess. I believe the only fix for brick and mortar retailing is rightsizing by the closing and evaporation of, you pick the number, 10%, 20%, 30% of the weakest space. This very painful process will surely take more than five years. It will also create enormous opportunity for those with the capital and management platforms to feed on the carnage. So if we were so prescient as to predict the secular decline in retail, and sell our malls, and spin our strips, why did we keep our Manhattan flagship street retail? We believe Upper Fifth Avenue is enduring (read forever). We believe Times Square is enduring and unique. We believe in the handful of world cities. And, we believe the quality and scale of our Manhattan flagship portfolio is unique, irreplaceable and commands a premium. Of course, even we are not immune. It’s only to be expected when a tenant’s basic business model is being threatened that they hunker down rather than step up. For flagship retail (and for A+ malls), this is a pause, a cyclical bump. For everybody else, it is secular disruption. Interestingly, several fast fashion retailers have told me that their 10-year plan is for smaller fleets (fewer stores), but with more and larger flagships. That strategy makes eminent sense to me. We sold the malls (into a very strong market) and spun off the strips in half measure anticipating secular decline (note the current softness in retail) and recognizing that with only a handful of malls, we were in no man’s land, and in half measure to de-conglomerate i.e., there is no real benefit in having $50 million shopping centers in New Jersey, no matter how great they may be, together with million square foot office towers in Manhattan. I believe the decision to exit the mall business will look better and better as each year goes by. Retailing stinks, right? Well, maybe not… note that the richest people in Europe are all retailers, the founders of: Zara, H&M, Ikea, LVMH and that the richest in the US is a retailer, if you aggregate the wealth of Sam Walton’s heirs. The next highest country is Canada with 17 square feet per capita, Norway is next with 10 square feet, all the mature European countries are in single digits. Further, the 24 per square foot number is not credible. There are 17.7 billion square feet of total retail establishments (both in and out of shopping centers) versus a population of 323 million or a startling 54.9 square feet per capita. Granted this larger number now includes car dealerships and the like, but it also includes all the freestanding Walmarts, Costcos, etc. This sheet of paper was provided at of the Ben Graham Centre’s 2017 Value Investing Conference that I attended last week. Tony Fell, the retired Chairman of RBC Capital Markets & Former CEO, used it during his speech. He was with RBC Capital Markets and its predecessor for 48 years. We often hear and see that M&A is not as successful as it should. We hear that’s it’s the culture or this or that for the main cause of failure. The list below is brief and useful. Here are the major causes of failed acquisitions and how to avoid them. I particularly like point #3 and #12. Start off by reminding yourself that fully 2/3 of acquisitions do not work out and actually destroy shareholder value. The odds are two-thirds stacked against you from the get go. Always remember – the best deal you do in your career is often the one you don’t do. Always remember the buyer needs a thousand eyes – the seller only needs one. Beware so-called major transformational mergers or acquisitions – they usually blow up and many have been catastrophic. In any takeover usually best to be the seller and get a good premium. Synergies are often significantly over-estimated and take longer to achieve than forecast. Hold your ego in check, don’t get caught up in the euphoria of an acquisition and pay too much. When you pay too much, your returns may be terrible and your may be faced with substantial write-offs. Beware poor, or incomplete acquisition due diligence. Nothing worse than major operational or financial surprises after you buy a company. Calculate earnings accretion or dilution based on constant leverage ratio. Accretion due to increased leverage is not accretion. Beware of potential clashes in corporate culture of two merging companies. Remember that the vision of the acquisition is great but execution is where it’s at. It’s one thing to acquire a company, it’s quite another to integrate it into your own business and run it. Vision without execution is hallucination. No acquisition is make or break. There is always another train. On any acquisition don’t increase leverage beyond a very prudent level. Finance with equity. Beware international acquisitions. Foreign markets are often more competitive than Canadian markets with lower margins. Don’t expand beyond your ability to manage tightly. Notwithstanding the above perhaps 10%-20% of acquisitions are outstanding successes. If you like financial history, this piece of marketing is too good not to share. Thanks to François Denault, a value investor from Montreal, for the find. Here’s the pamphlet of Long-Term Capital Management (LTCM)’s marketing pamphlet. The stock photos are absolutely ridiculous. I can’t imagine anybody working there looking like that. 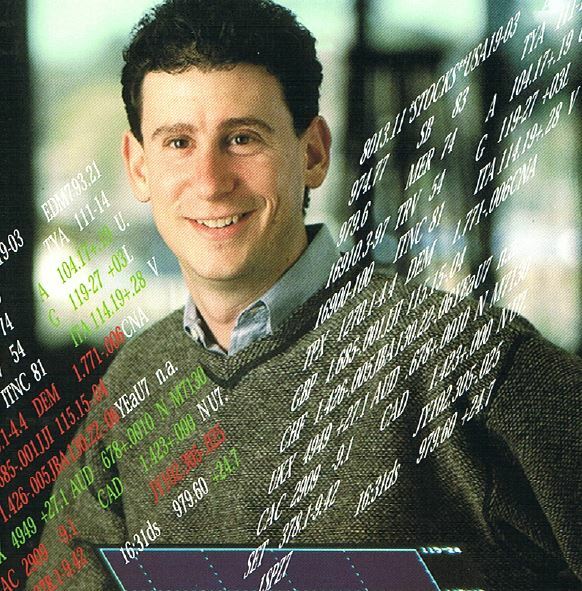 If there’s a museum of ridiculous financial artifacts, this should be up there. For the younger readers of this blog, Long-Term Capital Management (LTCM) almost brought down the financial system in 1998. 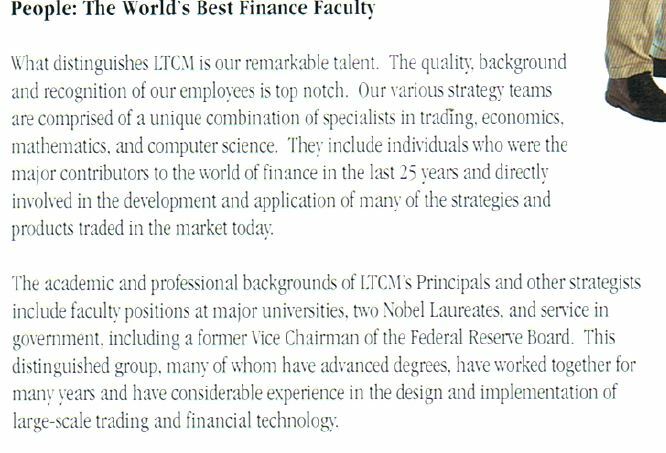 LTCM was founded in 1994 by John W. Meriwether, the former vice-chairman and head of bond trading at Salomon Brothers. Again with the financial history, what happened at Salomon Brothers wasn’t pretty either. You may remember Meriwether from such books as Michael Lewis’ Liar’s Poker, in which Lewis painted his old boss as a high-stakes gambler (read it if you haven’t). Anyway, John Meriwether, the investment wizard (gambler/speculator), assembles the “dream team” of Wall-Street, which included two economists with a Nobel prize and the Vice-Chairman of the Federal Reserve. The best of Wall-Street under one roof. 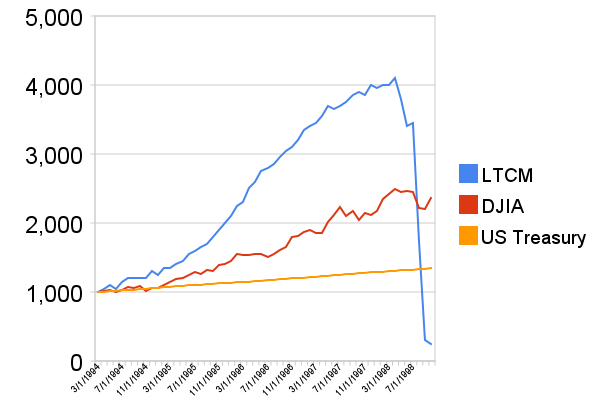 Initially successful at first, LTCM used a highly leveraged strategy that backfired following the 1997 Asian financial crisis and 1998 Russian financial crisis requiring financial intervention by the Federal Reserve. By 1998 LTCM had amassed about $125 billion in debts against $4.7 billion in assets, and the notional value of its derivative positions had ballooned to well more than $1 trillion. On the eve of the bailout, LTCM’s leverage ratio had ballooned to 50-to-1, but investor flight further reduced the firm’s capital base before the bailout could calm the herd. The Federal Reserve of New-York organized a $3.6 billion bailout because LTCM’s failure could cause a chain reaction in numerous markets, causing catastrophic losses throughout the financial system. This was similar to what we saw in 2008 on a larger scale. Chipotle is going throw a rough time from a 2015 food safety issues but it will eventually bounce back. Improved governance and focus on operations will help repair the bruised reputation. The passage of time will eventually help too. Look at the ingredients on the list. These are just things that I can understand. It’s definitely having a positive on the way we eat and the fast food industry in general. Other restaurant companies are jumping on the bandwagon and offering fresh food. It’s only going to get better as the consumer becomes more informed and as a result request better options. *I’m not and never was a shareholder of Chipotle.